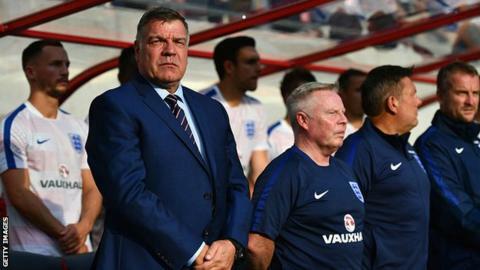 The Football Association is investigating allegations England manager Sam Allardyce used his role to negotiate a £400,000 deal and offer advice on how to "get around" rules on player transfers. It was due to meet on Tuesday when new chairman Greg Clarke and chief executive Martin Glenn must decide whether the issue is one of poor judgement or something more serious. What is third-party ownership and why is it banned? Allardyce vehemently denied the claims and a subsequent FA investigation found no evidence of wrongdoing. "One aspect to the story - and you don't get it from the headline - is that Allardyce repeatedly said he would have to get it cleared by the FA. "His exact quote was 'I'll have to run it by the powers that be'. That's in terms of what he was allegedly being offered. "However, it's still very serious for the FA. It's uncomfortable and it's embarrassing for Allardyce, just two months into a two-year deal as manager. "I think his future at the moment faces real scrutiny. Some may say his job is under threat. That's what the FA will have to decide. "Is it a question of poor judgement or something more serious? The next 24 hours are going to be very, very interesting."